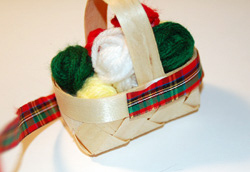 This knitting basket ornament is so simple to make, and it makes a perfect gift for someone who loves to knit. 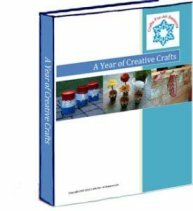 You can use any color yarn, just see what yarn scraps you have. 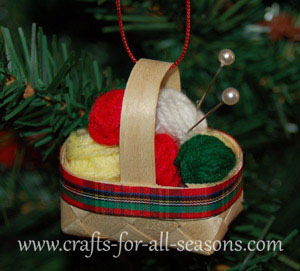 The Christmas ornament does look good with some red and green yarn balls in it though. This will look so cute hanging on your tree this year! 1. Begin by making the yarn balls. To begin to roll a ball, first wrap the yarn around your finger a few times. 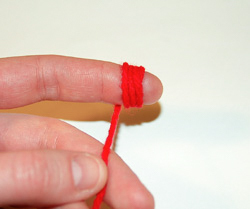 Then slide these loops off your finger and begin to wrap the yarn around the loop, in the middle. Then, fold this in half and keep rolling the yarn around and around. Don’t make your yarn balls too big. This ornament looks cuter when there are several small balls as opposed to 3 or 4 big balls of yarn. 2. 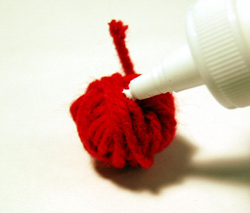 Use some glue to attach the end of the yarn to the ball. 3. 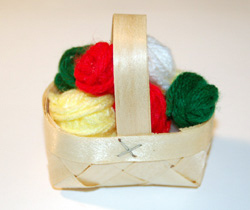 After making about 6 or 7 balls, glue two cotton balls to the inside of the basket. 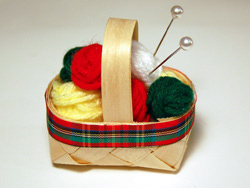 This puts some stuffing in the basket so you don’t have to make as many yarn balls. 4. Next, arrange in all the yarn balls, and glue them in place. Put some on top of one another, and make sure you are covering up all the cotton . 5. 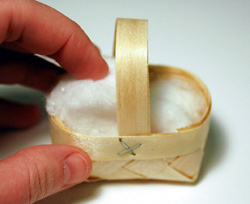 Cut a length of ribbon to fit around the basket. Glue this in place. 6. 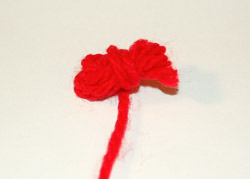 Place the two hat pins in the yarn, near each other. These are the knitting needles. 7. Add a craft cord for hanging and it’s done!